These days Zepto entices customers by a big price reduction for its Znote 3415W 'Power'. Besides a Penryn-CPU T9500 and a huge RAM capacity of 4GB also the mass storage capacity is big. The 200 GB hard disk runs at a revolution speed of 7,200 rpm, and a GeForce 8600M GT ensures high performance graphics. All aboard! 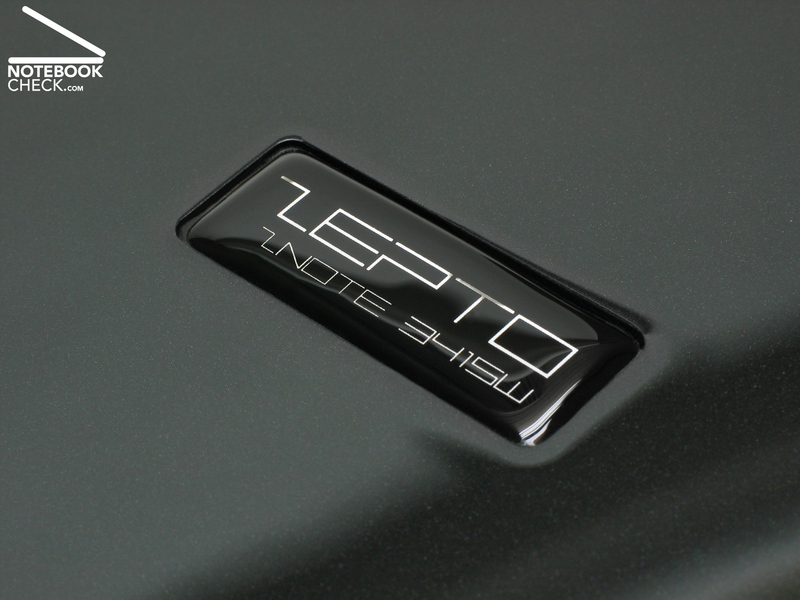 Zepto sets the course for notebooks ins Scandinavia. Today the Danish 'Znote 3415W' is also available in Germany, whereas the reviewed version is really powerful. 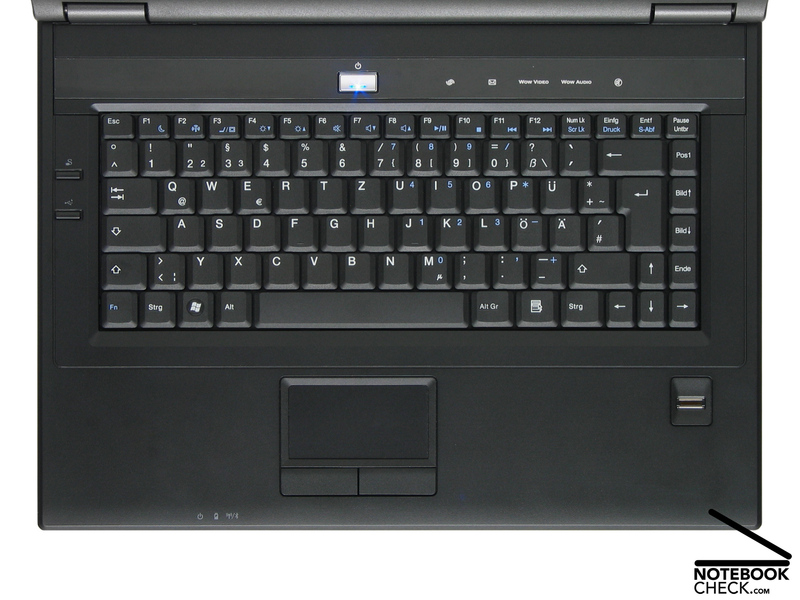 The specification plate informs that it is equipped with one of today's fastest mobile processors, an Intel Core 2 Duo Mobile T9500. This review describes how we liked working with the Znote 3415W express. Note: The Zepto Znote 3415W is based on the Barebone FL90 (IFL90-030 UM) by Compal. Depending on the chosen components, the 3415W can be, therefore, compared with the Bullmann V-Klasse 8 Cenduo+, the FL90 Deluxe by Schenker or the Nexoc Osiris E619. The Znote 3415W by Zepto looks modern and elegant. However, due to its size of 36.5 cm x 27.0 cm x 3.9 to 4.5 cm, it appears to be a little bit bulky, yet, not extraordinary for this notebook category. Furthermore, with a total weight of 2.9 kg the Znote 3415W is everything but not one of the lightest of the popular 15.4 inch multimedia notebooks. The silver-grey-black metallic lid is one of the highlights of this 15.4 inch notebook. However, it demands intensive cleaning every now and then, because this finish is sensitive to fingerprints and dust, which are always visible after usual use. But, that's not all. It is unfortunately also sensitive to tiny scratches. But, this glossy lid works without problems. Despite a transport hook is missing, the lid is safely kept close. It is more or less non-pressure-sensitive if the force is moderate. The pressure test does not lead to distortions on the screen. The two firm and self-locking hinges are able to support any opening angle without problems. Furthermore, there is hardly any see-saw after adjusting the opening angle. 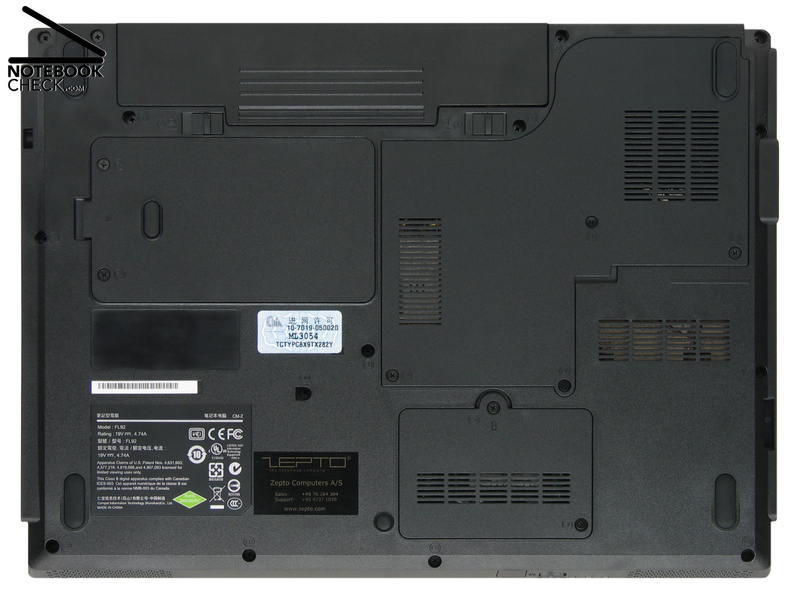 The inner part of the Znote 3415W is simple black without striking lights or glitter. Only the silver illuminated power switch and web cam with chrome surround attract attention. But, the touch-sensitive hot keys in front of the screen and the fingerprint reader are rather decent. Furthermore, the position of the indicator LEDs is disadvantageous . The are hardly visible, if you do not leave your usual working position. The case of the Znote 3415W is in general passable. However, the pressure and the flexural rigidity could be better. If you pick it up the case slightly gives and you can hear a clear creaking close to the hot keys in front of the display and at the bottom side. But the workmanship and accuracy of fit are all right. 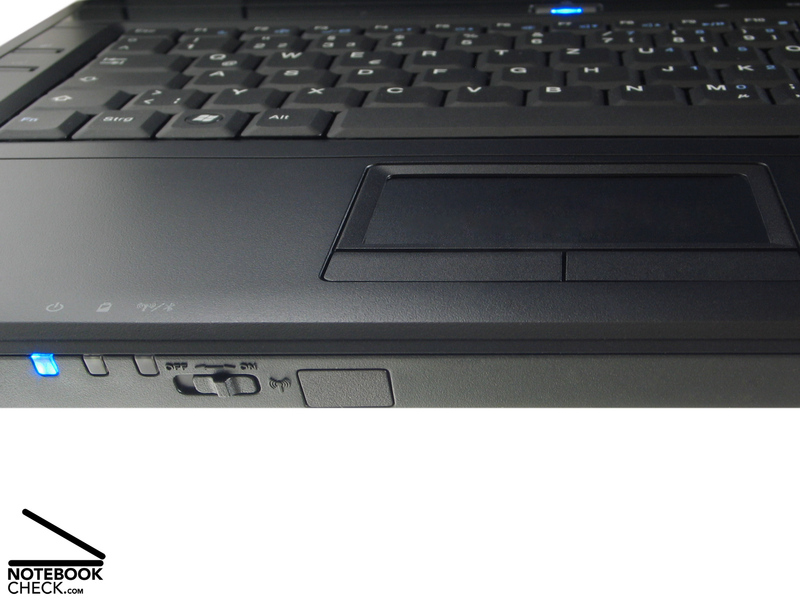 The interface equipment is standard for a 15.4 inch multimedia notebook. 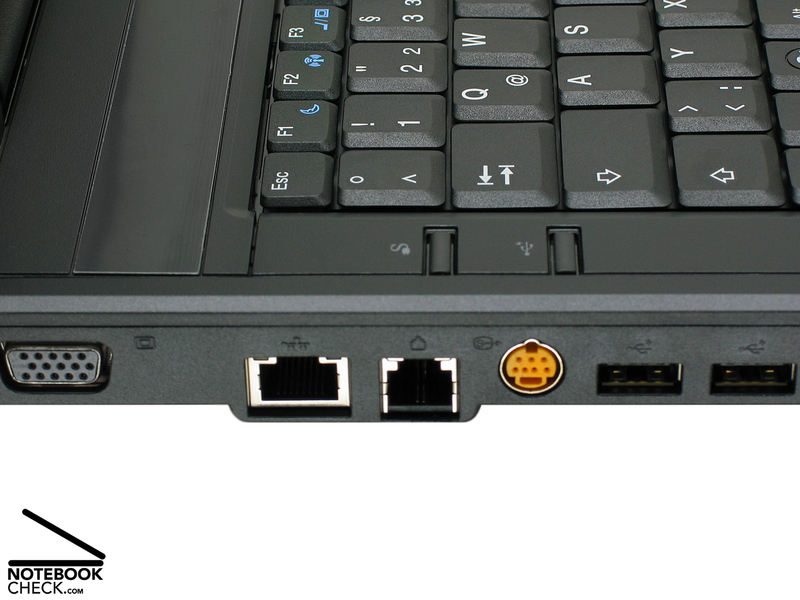 It consists of four USB 2.0 ports, FireWire (i.LINK, IEEE 1394), audio ports, S-Video out, and VGA. 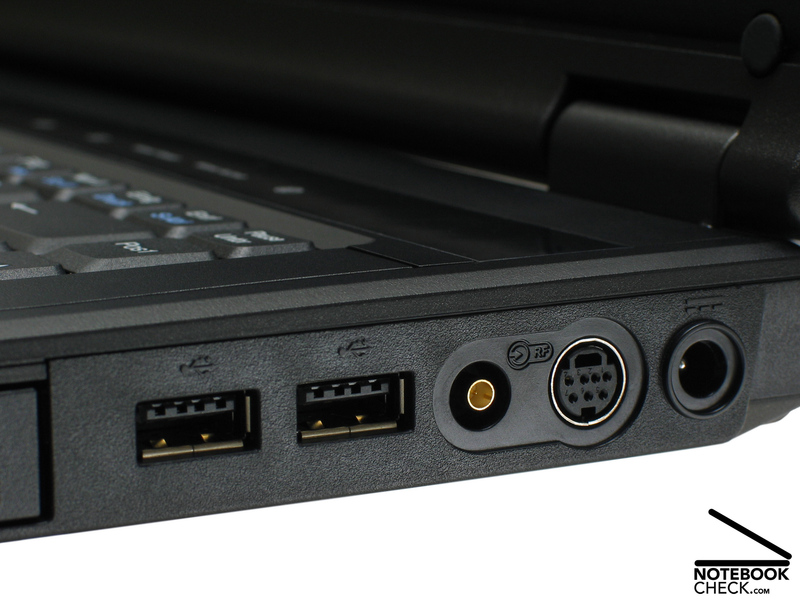 The two USB 2.0 ports at the left notebook side are high power ports. If some peripherals require more power, you can switch this feature on by pressing the power USB button and, these higher-power devices, e.g., iPods or external hard disks, obtain more power through the USB host. 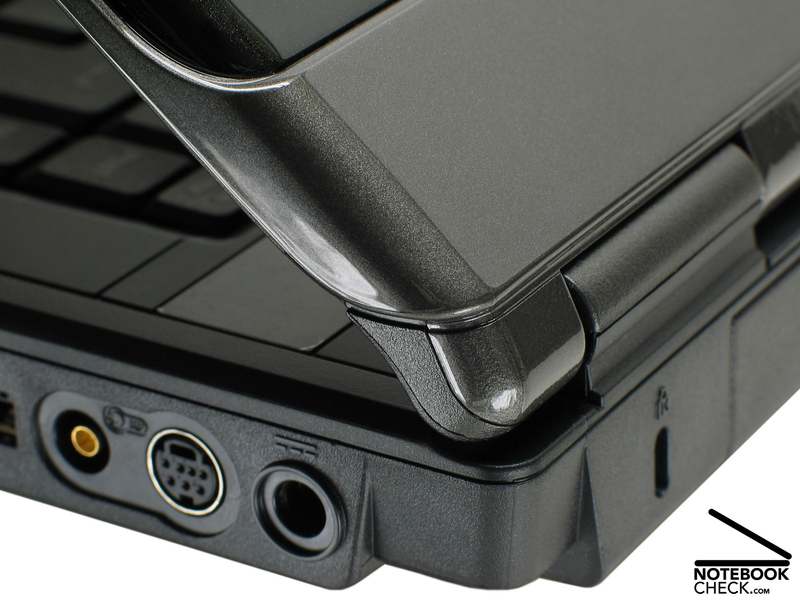 You can even recharge an iPod via this port if the notebook is turned off. 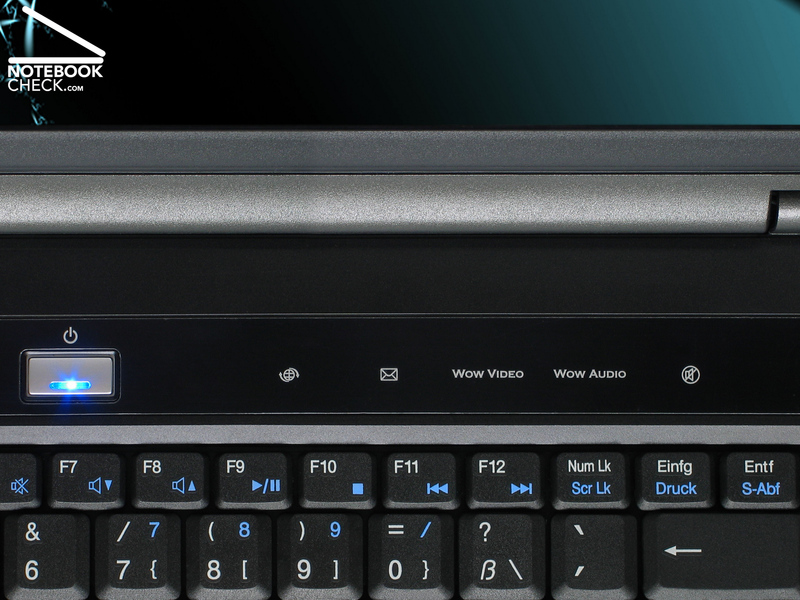 A modern ExpressCard/54 slot and a 3-in-1 card reader are also standard features of today's 15.4 inch multimedia notebooks. But, the fingerprint reader, which is located at the right palm rest area and makes user authentication without password possible, is not. The built-in 2 MP web cam does not only allow video chats with friends. Because it can also distinguish faces, it allows access control by videos. In spite of the otherwise good interface equipment there is one point of critique left: A digital video out (DVI, HDMI) is missing. Wireless data communication is possible via Gigabit LAN, which is today's fastest wired LAN connection - provided the remote devices supports it too. The usual modem interface is of course also available. Stable wireless communications is either implemented by Intel's PRO/Wireless 4965AGN or Zepto's Wpro WLAN module (AzurWave/Ralink). Both of them support 802.11 Draft-n, which allows transfer rates of up to 300 MBit/s. Bluetooth 2.0, which makes modern wireless telephony possible, is available for 28 Euros extra. 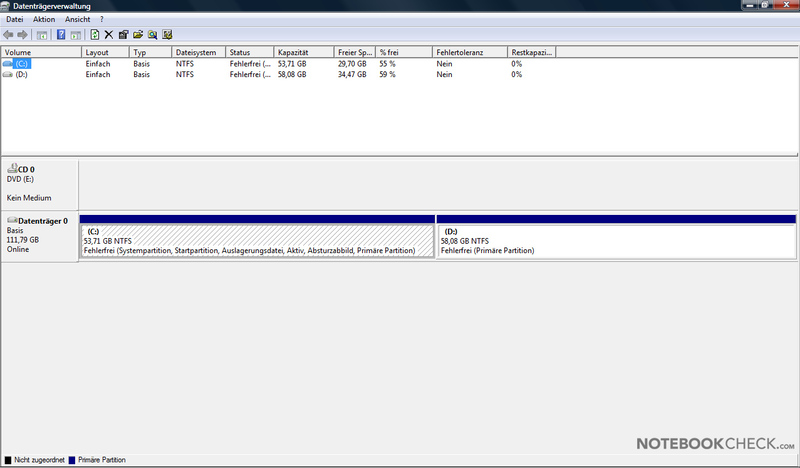 However, a UMTS/HSDPA option is not available. 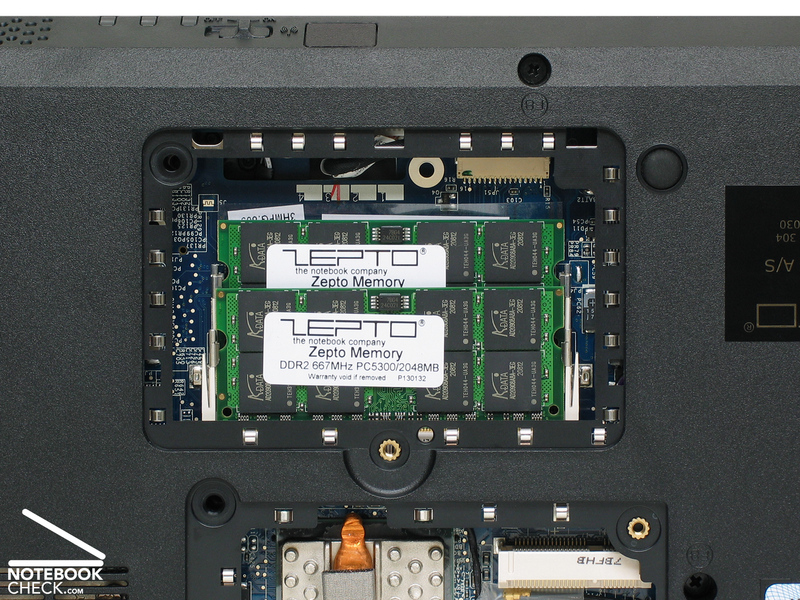 Zepto issues a 'carry-in' warranty for Germany and EU countries of 24 month. A more convenient warranty option which includes picking the notebook up from anywhere in Germany, is available for 30 Euros extra. Extending the warranty to 36 month costs 156 Euros more. The customer also has the choice regarding hardware and software accessories. E.g., you can either choose Windows XP or Vista, but drivers for XP cannot be downloaded from Zepto's support site. Frequently used system function can be user-friendly launched by seven hot keys. 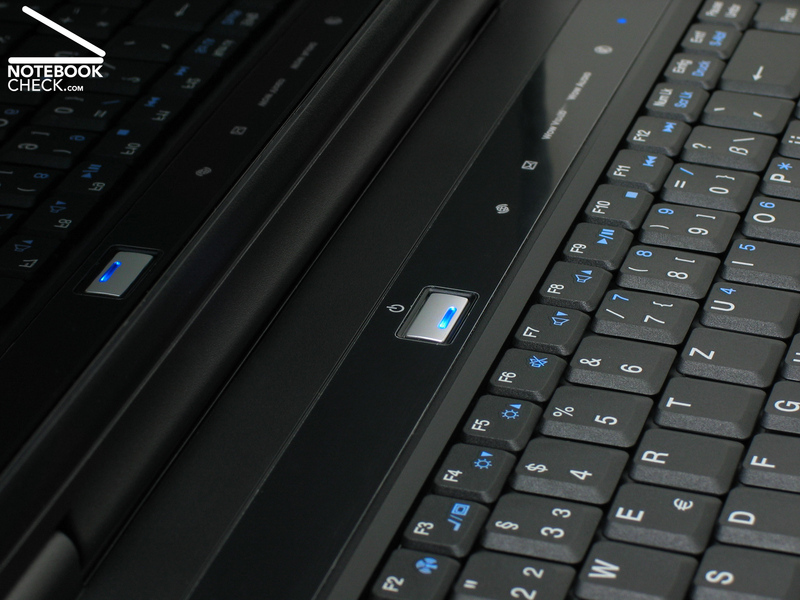 Two of them are left beside the keyboard, one of enables recharging the battery to 70% of its capacity within one hour. The other one allows energizing the two USB ports at the left side even if the notebook is turned off. However, we checked whether we could recharge a Trekstor player with hard disk via this port, but it did not work. The other five hot keys, touch-sensitive keys in front of the screen, launch the default e-mail application, the default web browser, WoW Video/Audio, and control the sound system. The indicator LEDs cannot be easily read off. 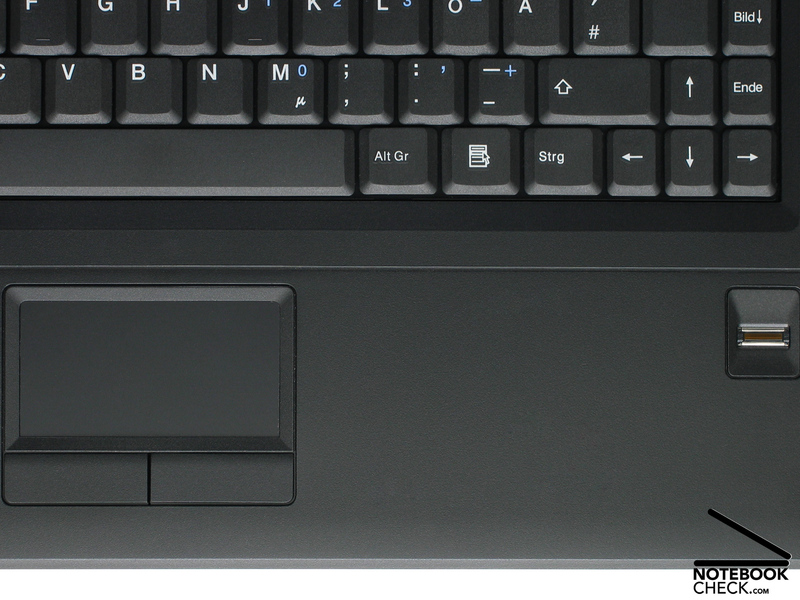 The Znote 3415W is equipped with a matte black keyboard with 87 keys. Their size is 1.5 cm x 1.3 cm, so they are a little bit smaller than those of desktop keyboards. But, the keys are comparably tightly attached to the base construction. The key travel is short and the feedback firm - a matter of taste. The big keys, e.g., space-bar and enter clatter clearly audible. 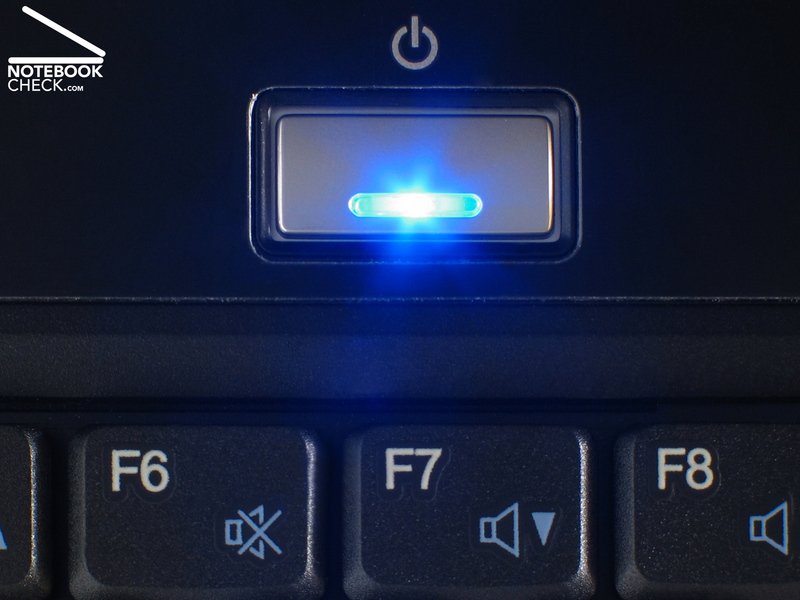 At first typing mistakes are likely, because the keyboard layout does not follow the usual standard: E.g., the left 'Fn' key and the 'Ctrl' key are in reverse order and the 'Del' key is not totally at the right top. 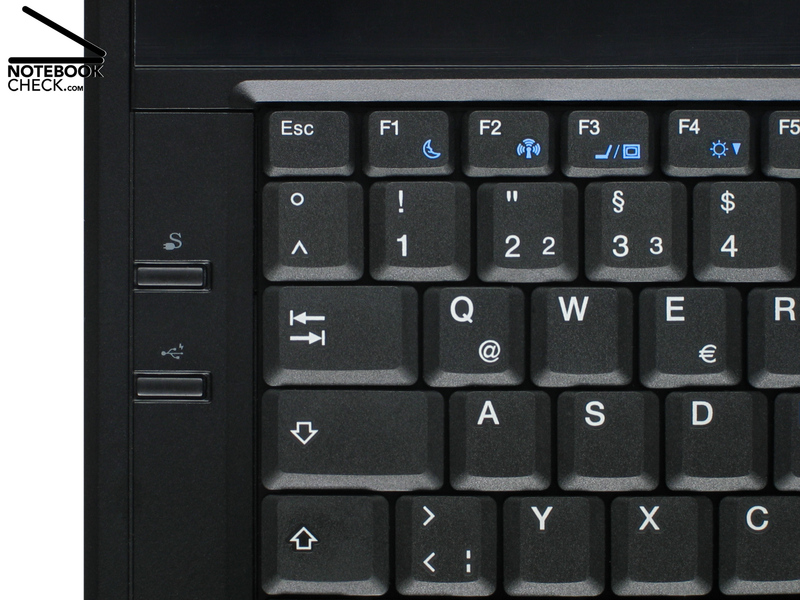 The area of the '9' and the 'F10' key slightly gives when typing. The touch pad has a size of 7.0 cm x 3.7 cm, which is rather big. But, controlling the mouse pointer by touch pad is difficult: It is not sufficiently sensitive, so, it is difficult to precisely control the mouse pointer. Also an optically marked scroll area is missing. But, both of the touch pad buttons have a user-friendly short travel, however, they are unfortunately loud. Contrary to the specifications published at Zepto's web site, the reviewed Znote 3415W was neither equipped with a WSXGA screen nor with a WXGA+ screen. 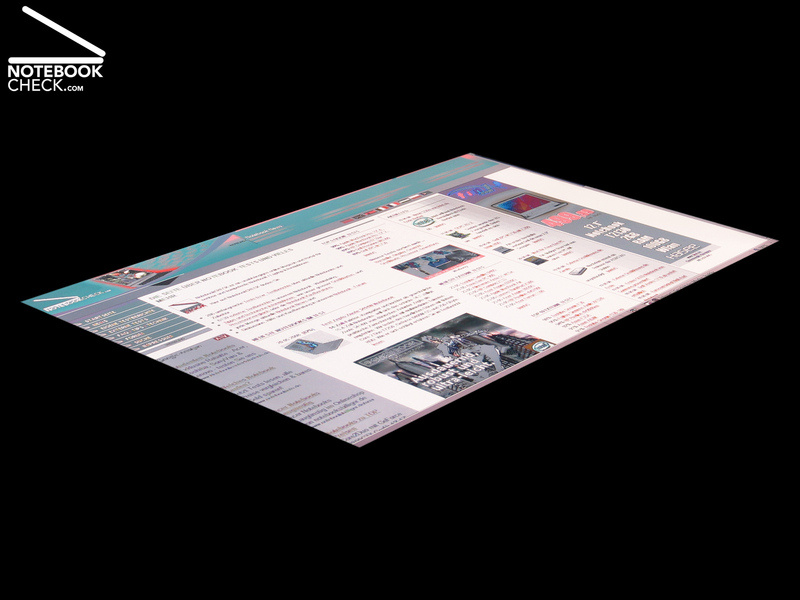 Instead it came with a 15.4 inch WXGA screen (39.12 cm) with a 16:10 aspect ratio. 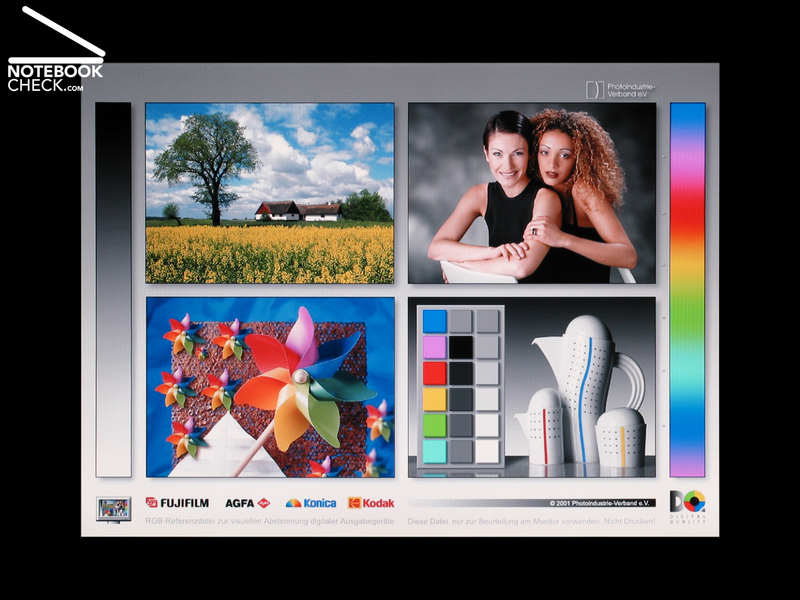 This panel was made by Chunghwa Picture Tubes Ltd. (CPT, CLAA154WB034A) and is a reflecting display. The average brightness of it is 160.2 cd/m², which is just good. But, due to its reflecting surface the Znote 3415W is not really fit for outdoor usage. But, the illumination is 88.6 percent, which is quite even. The brightest area is 175 cd/m² in the centre of the screen, the darkest is 155.1 cd/m² in the left top area. So, the Znote3415W is one of the top notebooks of its category here. This gets most obvious when running office applications with white background. The contrast of this screen is not that good. A black value of 0.8 cd/m² gives together with the maximum brightness a contrast ratio of about 219:1, which is just average. 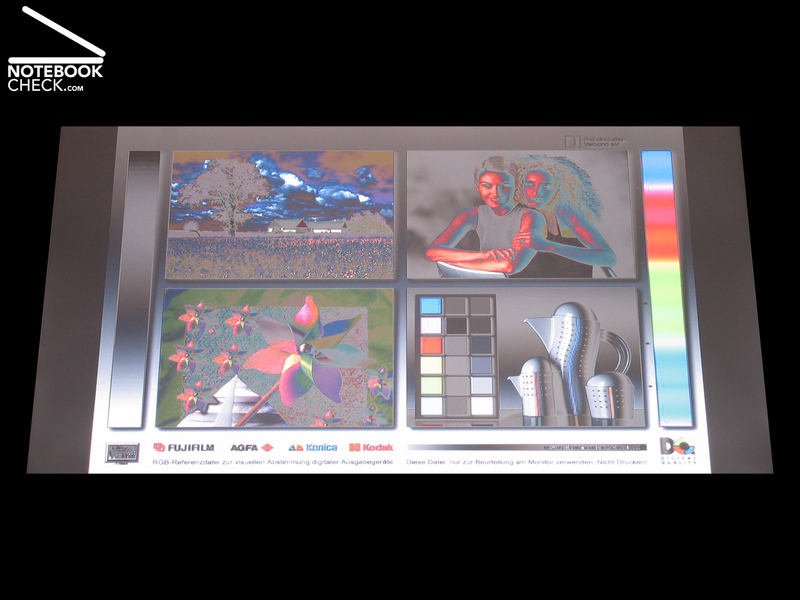 But, the colour diagram proves that the colour representation is just right, because it does fortunately not follow the trend to cold colours (blue tint) of today's flat screens. 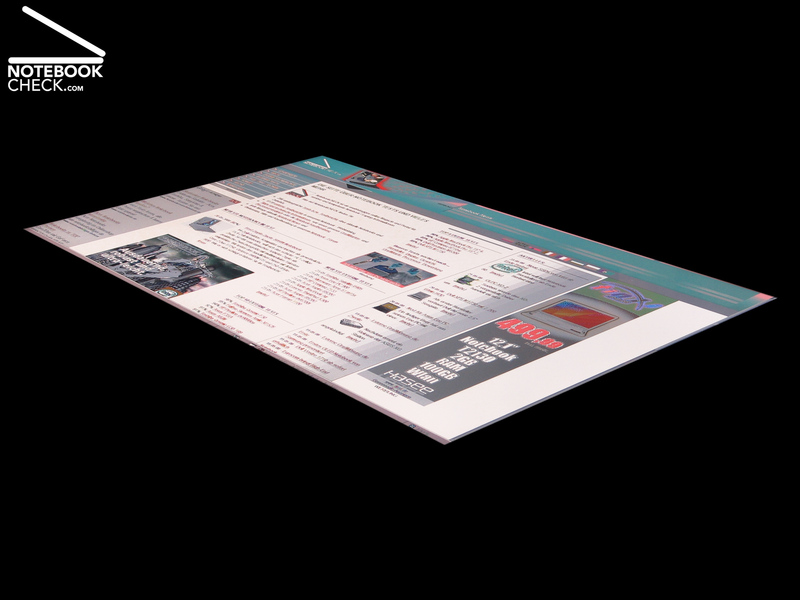 Now we are highly interested how this 15.4 inch display rates in our subjective evaluation. 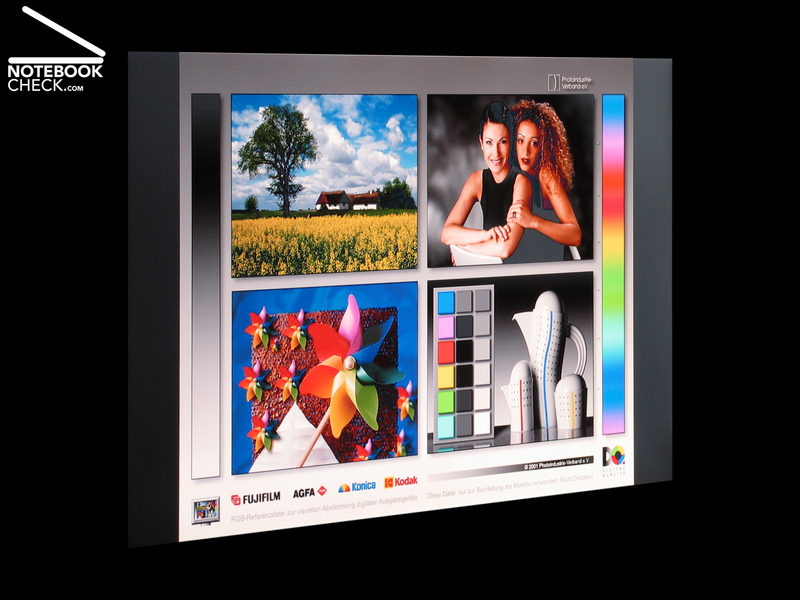 But also directly compared to our 20 inch reference screen, a Viewsonic VP2030b, it rates good. 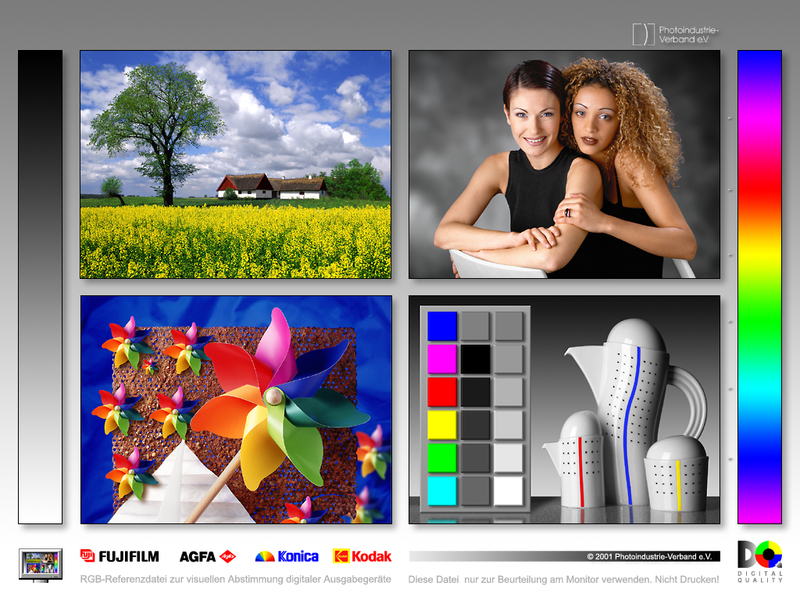 Directly comparing pictures with pictures displayed on the calibrated Viewsonic, we especially like the neutral and natural look of portraits. The colours are strong, but could be even more luminous considering it is a reflecting display. However, gradients do not look absolutely good on this screen. A clear dithering gets obvious here. If the background colour is dark or black, the background lightening gets apparent at the bottom part of the screen. If you play games this is not highly visible. 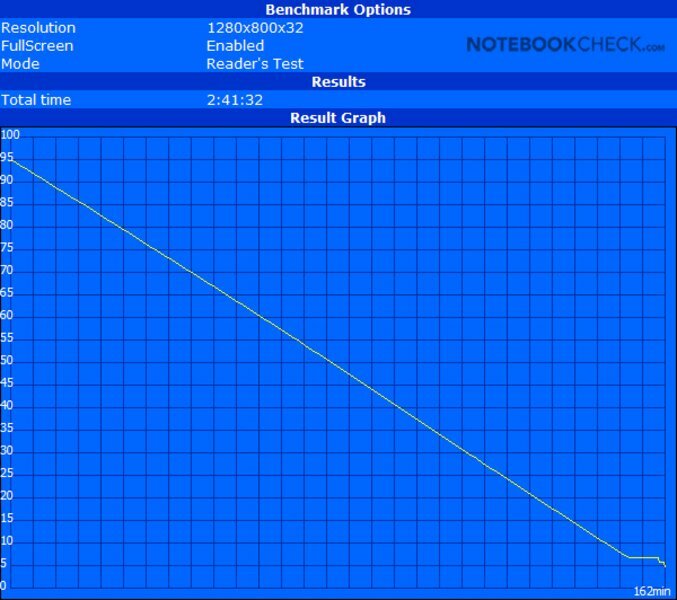 Alike other notebook screens of this category, the viewing angles are narrow. To summarize, the Znote 3415W is equipped with a good general purpose display. But, despite neutral colours, it does not seem to be appropriate for ambitious picture and video editing, because of the obvious dithering. 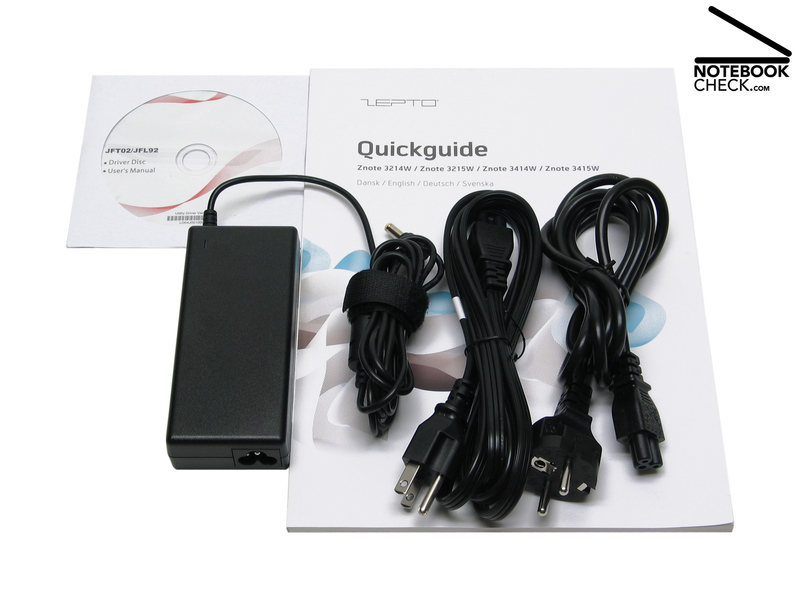 The Znote 3415W can be individually configured in the on-line shop of Zepto. There are choices regarding processor, kind and size of RAM and hard disk, extent and duration of warranty, and accessories. The version called 'power' is already available for 888 Euro. As already mentioned in the introduction the Znote 3415W is equipped with a very fast dual core processor by Intel. 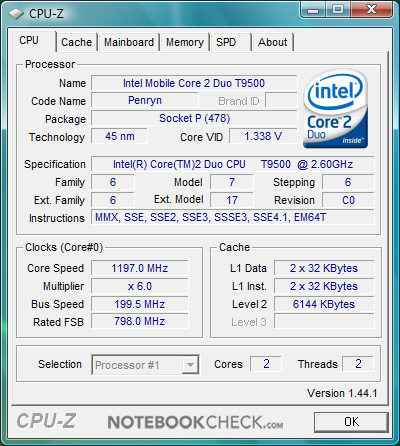 The Core 2 Duo processor T9500 with 2.6 GHz clock rate comes with 6MB second-level cache and a fast 800 MHz front-side bus (FSB). So, the computer was very fast regardless of the specific benchmark or test we ran and also with our editorial work. Therefore, there is no need to bother about performance in any way. The same is true for running Windows Vista. It does note only run smoothly on the Znote 3415W, the Znote is very agile. 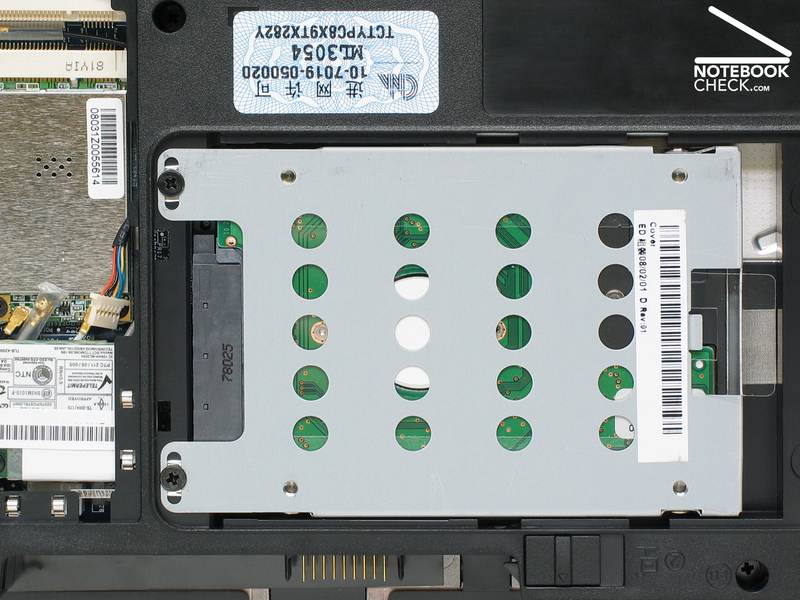 The two available RAM slots at the bottom side of the notebook are occupied by fast DDRII-667 modules. The reviewed notebook was equipped with two PC5300 module with a capacity of 2GB each, so providing a total of 4 GB RAM. 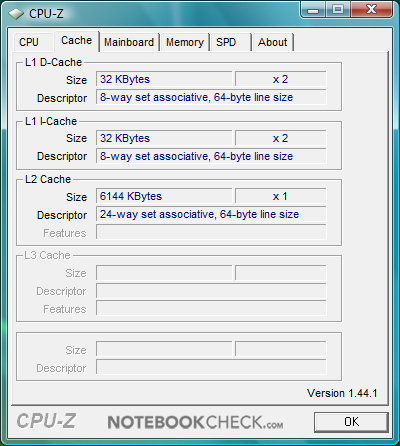 However, the 32 bit version of Vista can only address 3 GB, but also the 64 bit Vista can be installed on the Znote 3415W. 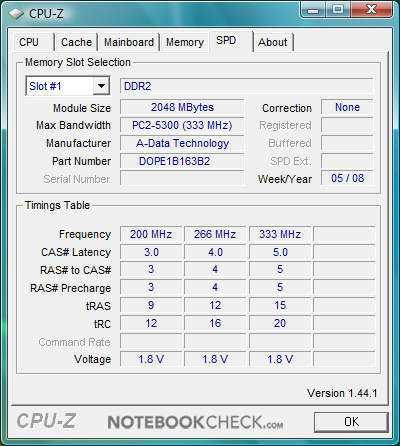 CPU-Z-Information of the Zepto Znote 3415W. The result of the synthetic application benchmarks of the Znote 3415W are very high. It reaches full 6,324 points in the PCMark05 benchmark by Futuremarks. This is brilliant and so, the Znote proves to be one of the top 15.4 inch multimedia notebooks in this aspect. Also the results of Cinebench R10 by Maxon hint on a high application performance: 'Rendering Multiple CPUs' results in excellent 5,437 CB-CPUs. 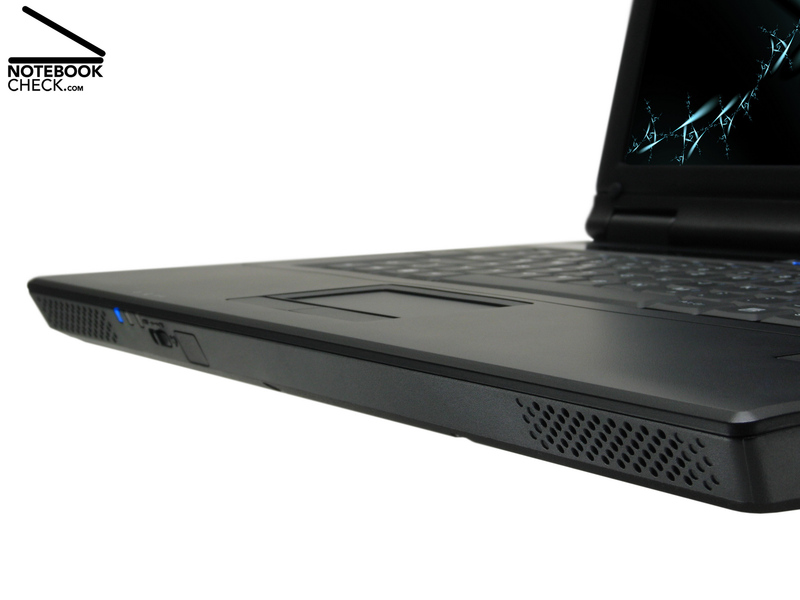 To summarize, the T9500 is indeed a brilliant CPU for demanding multimedia applications and video editing. The Znote 3415W is equipped with a fast middle class video chip, a Geforce 8600 GT by Nvidia. 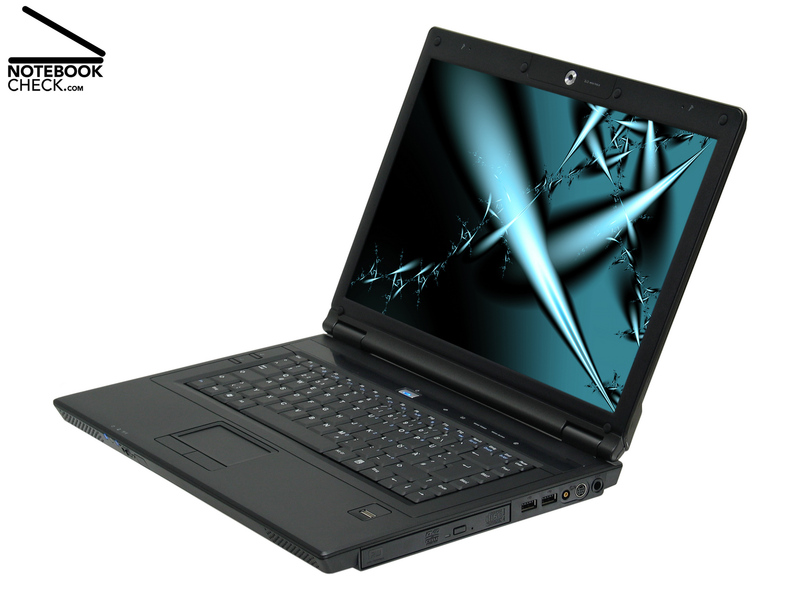 The GeForce 8600 GT can access 512 MB of dedicated GDDR2 memory and handles usual picture and video editing and multimedia with ease. Also the results of the video benchmarks are considering it is a multimedia notebook good. The 'Shading' test of Cinebench R10 results in 3,202 points. 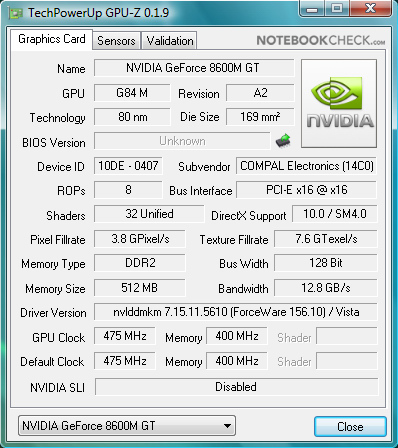 For comparison, the Aspire 6920G by Acer, which is equipped with a less powerful T8100 2.1 Ghz), but more up-to-date GeForce 9500M GS, reaches only 2,725 points. 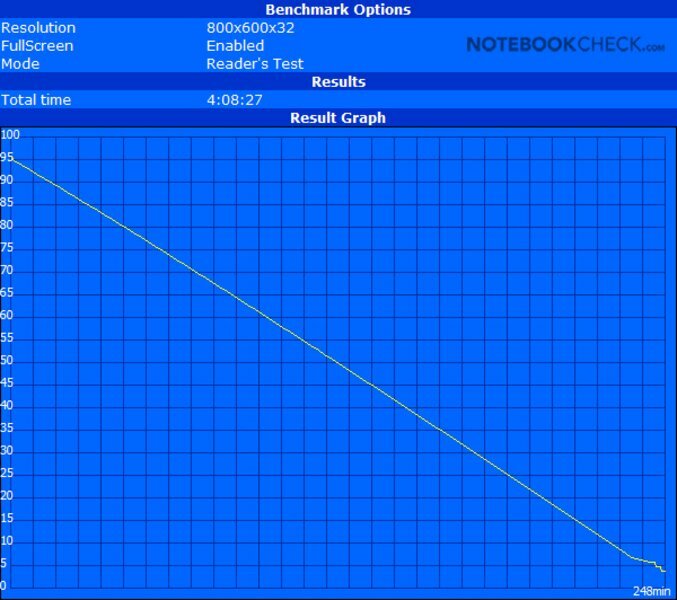 However, this Acer notebook performs even with T8100 CPU better in the 3DMark06 benchmark by Futuremark, where is reaches 3,584 points, the Znote 3415W, however, only 3,451 points. If you want to run current 3D-demanding games, you'll need to reduce resolution and detail level in order to achieve smooth frame rates with the GeForce 8600 GT. 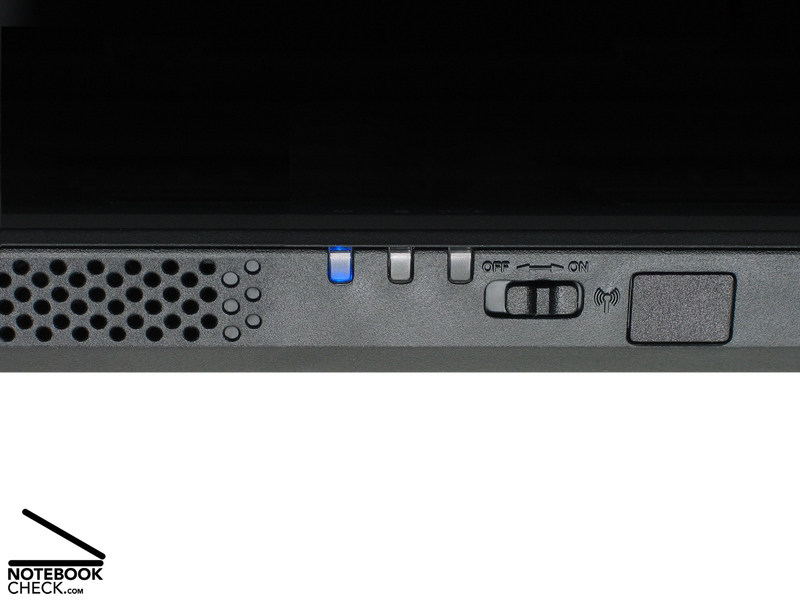 A Travelstar 7K200 HTS722012K9SA00 with 120 GB RAM allows fast data transfer. This SATA harddisk by Hitachi is equipped with 16 MB (!) cache instead of only 8MB and runs with a revolution speed of 7,200 rpm. 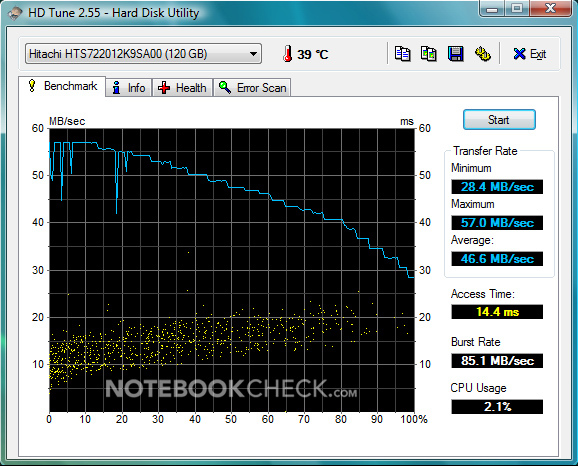 The HDTune benchmark proves that this 2.5 inch hard disk has an excellent average transfer rate of fast 46.6 MB/s. So, it even outperforms our reference hard disk, a ST910021A (100 GB, 7,200 rpm) by Seagate, which only reaches nearly 42 MB/s, in this aspect. 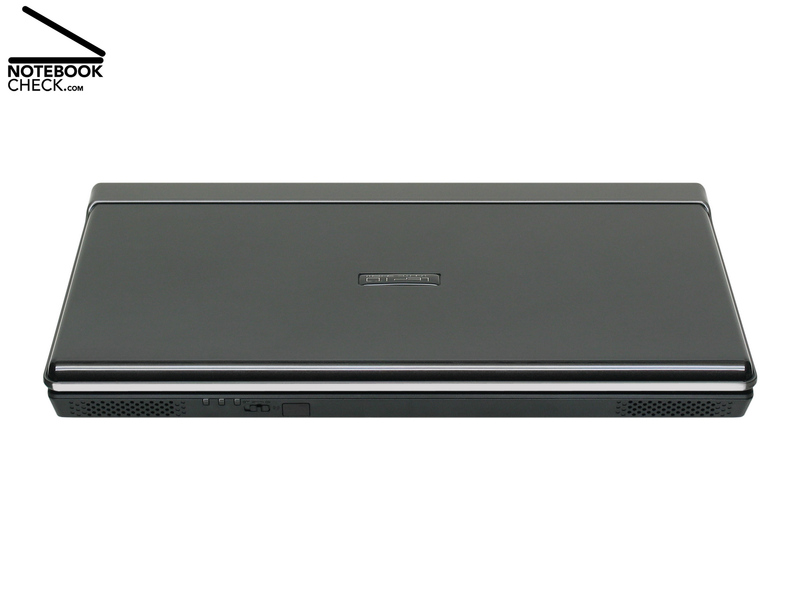 Furthermore, the Znote 3415W comes with a DVD burner SN-S082H by TSST (Toshiba Samsung Technology Corporation). In the meanwhile the Geforce 8600M GT by Nvidia became an appreciated general purpose middle class video card. 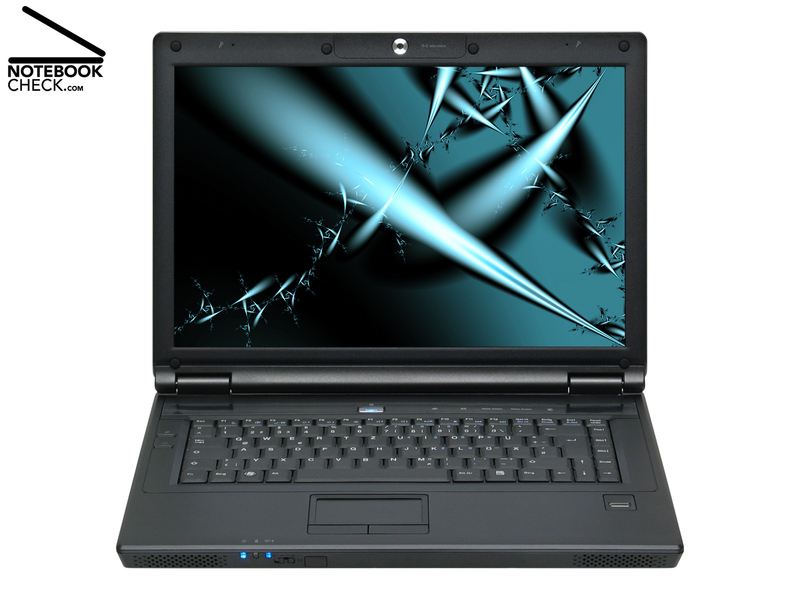 It is no problem to run some older, yet demanding games on this notebook, some of them even at a resolution of 1,280x800 pixels and high detail level. However, today's games do not run smoothly, especially, if they are configured for anti-aliasing, dynamic light/shade and volumetric particle effects. However, also today's most powerful desktop video cards games are used at their full capability when running games like Crysis and World in Conflict (WiC). 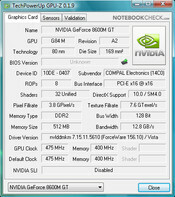 In general the gaming performance of the GeForce 8600M GT combined with the powerful T9500 is not bad. It reaches 3,451 points with ForceWare 156.10 (driver 7.15.11.5610) in the 3DMark06 by Futuremark. 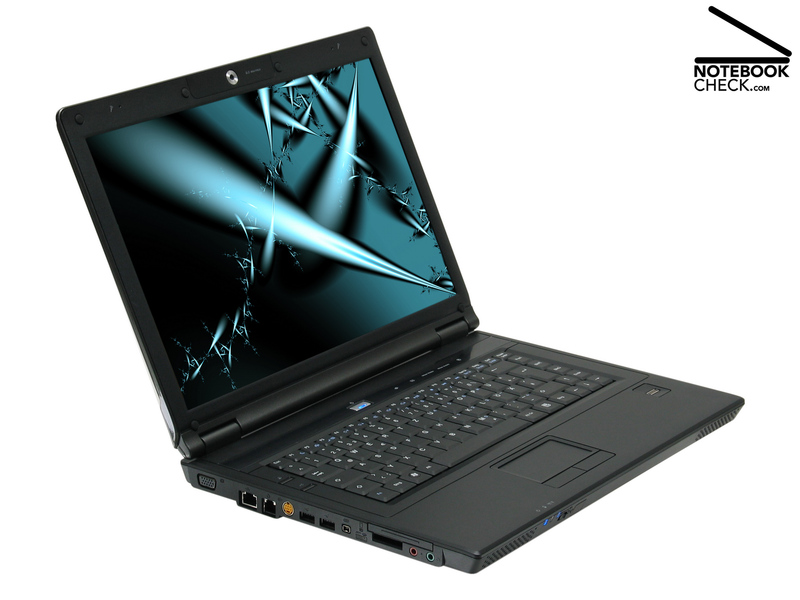 Nevertheless, it is not as good as similarly equipped notebooks with Geforce 9500M GT video card, the successor of the 8600M GT. Older games like Doom 3 run smoothly. We measured 79.2 fps when running at a resolution of 1.024 x 768 pixels and with details level ultra. However, Crysis and WiC only run smoothly, if the detail level is low. 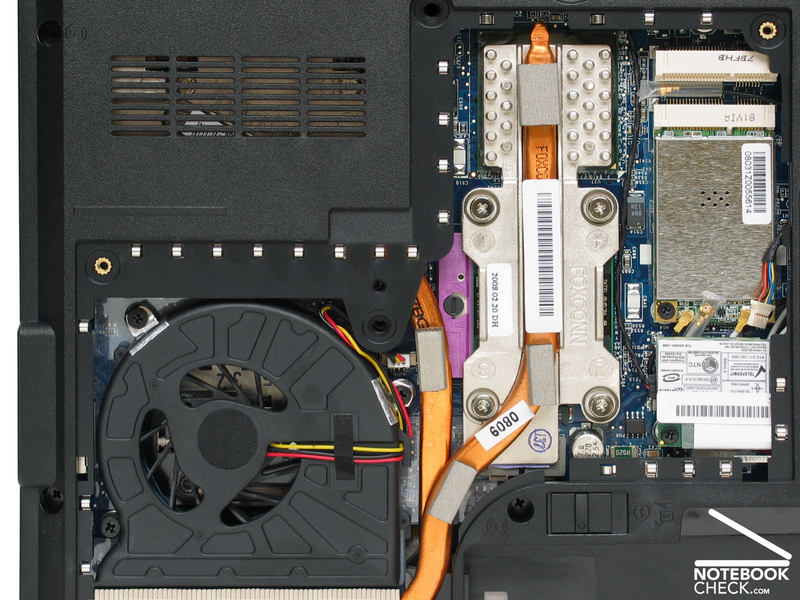 Despite its high performance, the cooling system of the Znote 3415W is rather quiet. In idle mode the maximum noise level is 32.2 db(A). Also the hard disk is except of a quiet rustling hardly audible and reaches a noise level of just 31.4 dB(A). The fan runs faster under average load, where we measure 34.2 dB(A). A noise level of 39.9 dB(A), which is clearly audible, can only be measured under full load. Once the fan runs that fast, you can also hear a high-frequency noise, which we didn't like. The maximum noise level is 41.3 dB(A), which is loud, but fortunately it is a low frequency noise. The burner is very quiet. In contrast to the Znote 3414W, which is actually equipped with the same DVD burner, a SN-S082H by TSST, the one inside the Znote 3415W is more quiet (44.4 db(A)). At the top side of the Znote 3415W we measure a maximum temperature of 42.8° Celsius at the left top area, whereas the room temperature was 20.3° Celsius. It is not very user-friendly that also the touch pad gets clearly warmer (38.8° Celsius). The average temperature at the bottom side is 36.2° Celsius, which is not really high. On the contrary, considering the powerful components, this is acceptable. The bottom sides of other multimedia notebooks with comparable performance, made by competitors, mostly get hotter. (±) The maximum temperature on the upper side is 42.8 °C / 109 F, compared to the average of 36.5 °C / 98 F, ranging from 21.1 to 71 °C for the class Multimedia. (-) The average temperature of the palmrest area of similar devices was 29.1 °C / 84.4 F (-9.7 °C / -17.4 F). 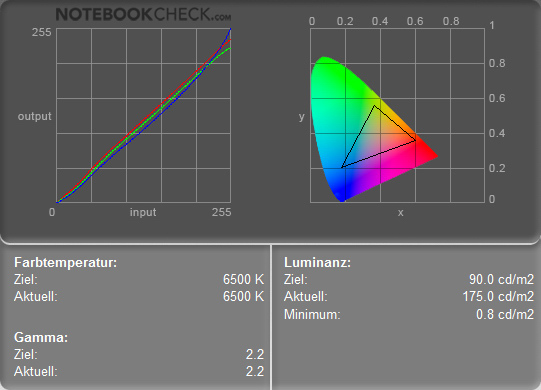 Of course one can expect a pleasant sound from a multimedia notebook. Nevertheless, most manufacturers do not attach great importance on it. The same is true for the Znote 3415W, which has a high volume, but the sound becomes blurred at high volumes. 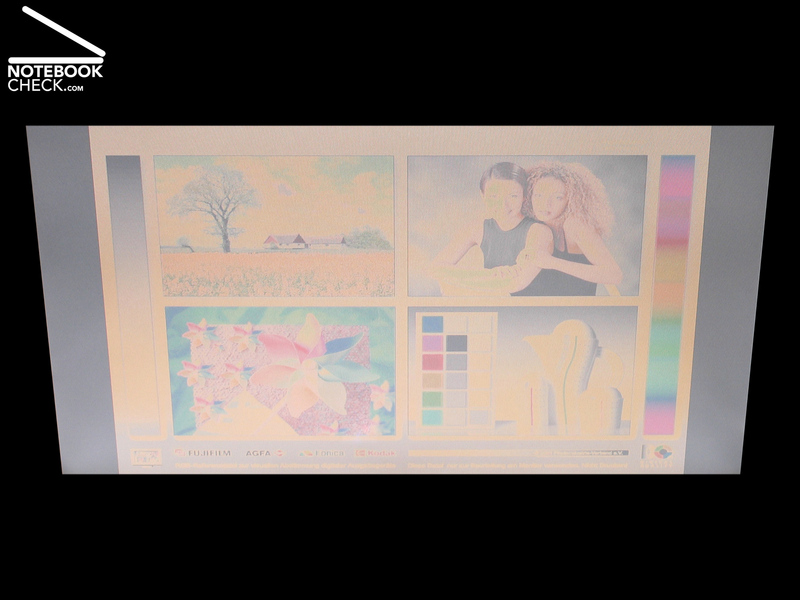 The middle tones dominate, the high tones are missing. To summarize, the sound of the Znote 3415W is somewhat dull . The output via analogue headphones port and Bose In-Ear headphones sounds clearly better. However, sometimes it cracks. The Znote 3415W demands much energy. The energy monitor displays an energy demand between 20.9 and 32.5 Watt in idle mode under Windows Vista. 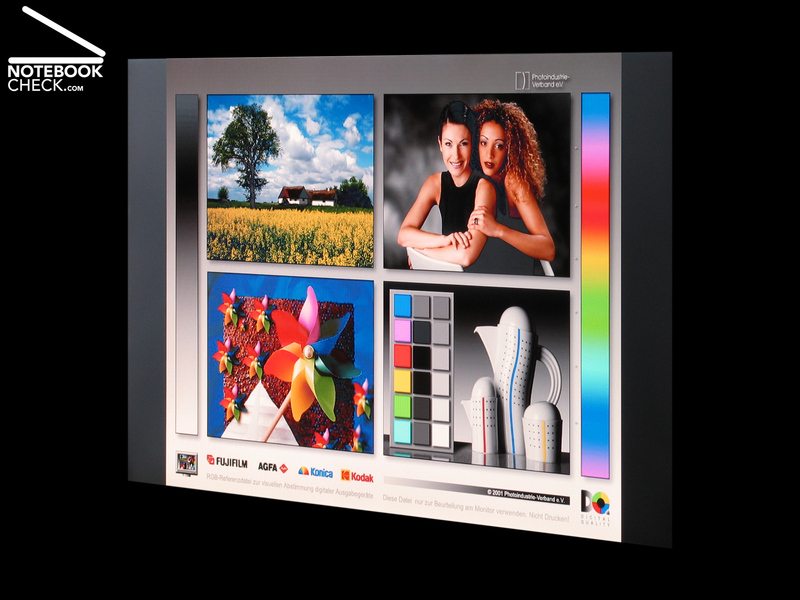 If a 3D screen is run, the energy demand is of course higher than without or with a less demanding screen savers. We measure 38.5 Watt. Compared to the Znote 6625WD (T9500), which is similarly equipped, the Znote 3415W demands about 16 to 28 percent less energy. Under average and full load the energy demand is even higher. The energy monitor displays when running Cinebench R10 with a single core 49.6 Watt and under full load 85.2 Watt. So, the Znote 3415W and the Znote 6625WD (T9500) do not demand much energy under load. The 3415W is worse than the 6625W in this aspect as it needs about 5 percent more energy. It is also surprising that the maximum energy demand is not reached when running computer games. When running World in Conflict we measure 'only' a maximum of 67.3 Watt. 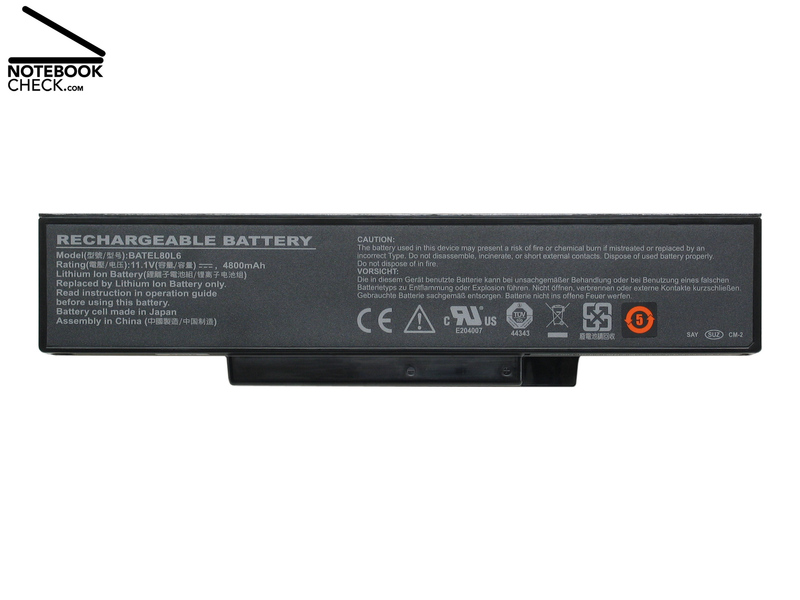 The provided standard battery is a 6 cells battery with 53 Wh. The maximum runtime measured by the Battery Eater Reader's test is nearly 2 hours 45 minutes. The minimum runtime measured by the Classic test is only a little more than one hour. Considering that this notebook is equipped with powerful components this is satisfying and comparable to other notebooks of this performance category. Furthermore, a 80 Wh 9 cells battery (11.1 Volt, 7,200 mAh) is available for just 21.53 Euro - brilliant! This powerful battery projects a little bit over the back side of this notebook. However, its battery runtime measured by the Battery Eater Reader's test is above four hours. The runtime measured by the Classic test is with this battery clearly above 1.5 hours. If you are going to work on battery a lot, you should definitely accept this reasonable offer. The only disadvantage is that this battery weighs 162 g more. The 'power' version of the Znote 3415W is indeed very powerful. Furthermore, its operating noise is quiet. The equipment can be customized with any of the up-to-date Penryn processors, a big and fast 200 GB hard disk, 4 GB RAM and 300 MBit/s WLAN. So, it is an ideal bundle for demanding power users. To summarize, the Znote 3415W rates good in the multimedia notebook category. However, it looses points, because a digital video out like DVI or HDMI is missing. A UMTS/HSDPA option is not really an obligatory requirement. Nevertheless, some competitors do provide it. The input devices are in general alright, but, compared to competitors there is still a potential for improvements. But, the display of the Znote 3415W is evenly illuminated. This Znote costs about 1,190 Euro. So, the price-performance ratio is also good. If you would upgrade the 'Value' version to a 'Power' version, the price would be 1,700 Euro, which would be definitely too high. Zepto Znote 3415W: The logo on the lid hints on being designed for multimedia. It is precisely finished. The interface equipment of the Znote 3415W offers all necessary interfaces. 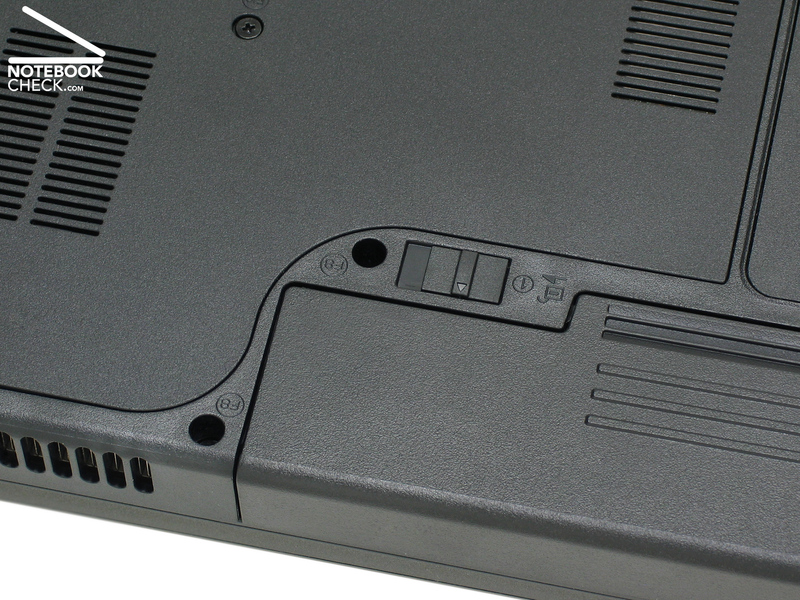 It includes an S-Video-In port, which is not provided by all competitor notebooks. However DVI or HDMI are missing. ... it is easy to access the core components via a number of maintenance openings. 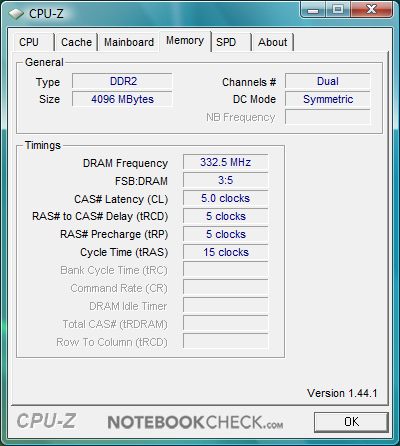 The RAM capacity is as high as 4 GB (PC2-5300). 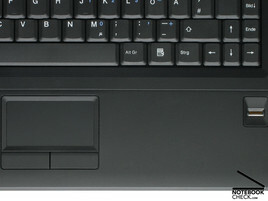 The cooling system of the 3415W works efficient and quiet, but, cannot prevent that the touch pad gets clearly warmer. 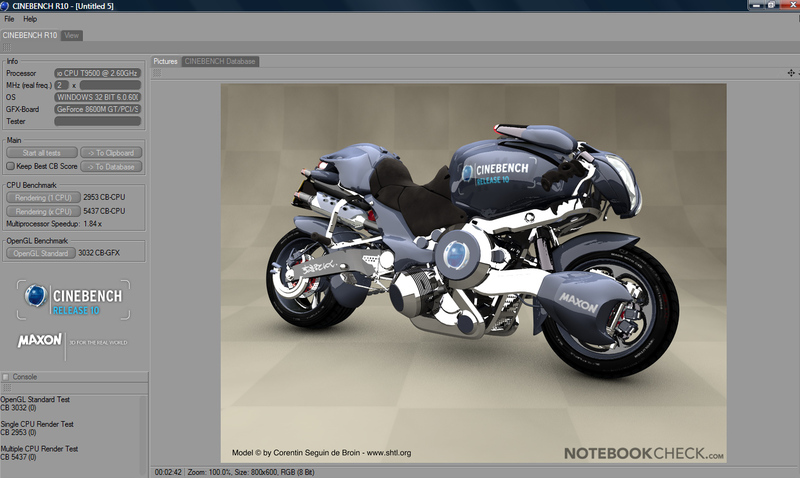 This notebook can be customized whereas the maximum hard disk capacity is 500 GB. The standard battery does not project over the back side, but, the optional 9 cells battery does. The battery runtime of the 6 cells 53 Wh battery was nearly 2.75 hours. This was inside the box of the reviewed notebook. If you change your look frequently, you can also use the built-in fingerprint reader. Take care: The electronic eye of the Znote 3415W is always watching you. The web cam can also be used for user authentication under Vista. The indicator LEDs work without problems, but, they are hardly visible, while typing. The finish itself appears to be of high quality. Nevertheless this glossy lid is sensitive to scratches. If you look at this 15.4 inch, you won't guess that it actually weighs as much as 2.9 kg. The size of this multimedia notebook is typical for this category. 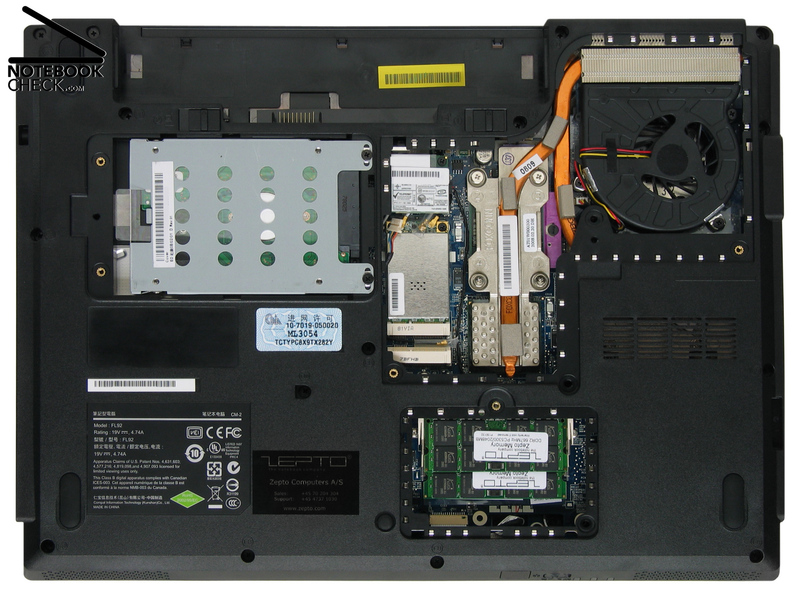 The inside of the Znote 3415W is simple in black without ornaments. ... are nearly too unimpressive. A optical feedback about their status would increase their user-friendliness. 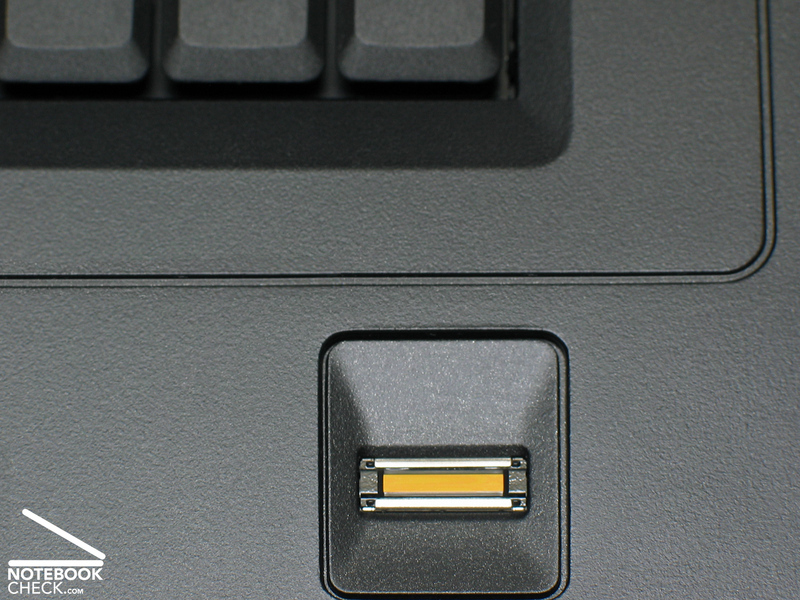 The top-most of the two hot keys on the right side is for faster battery recharging. 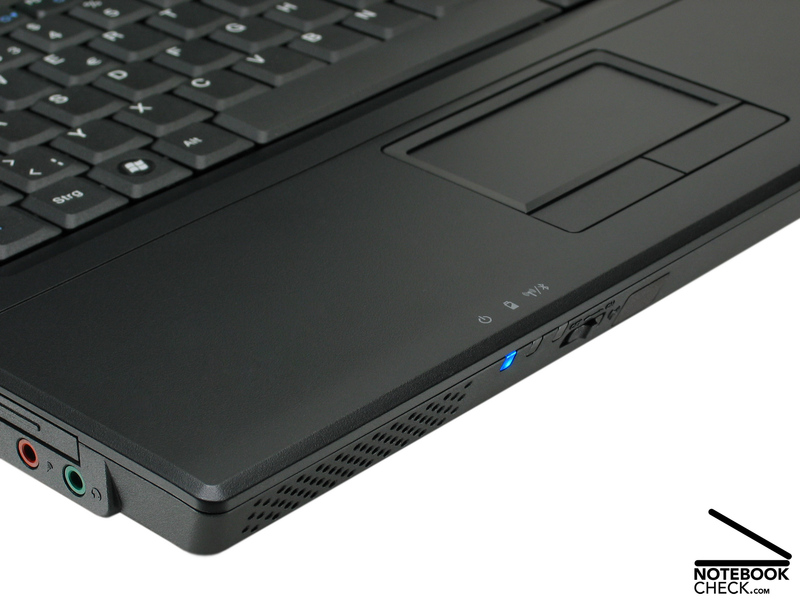 The one below powers the high-power USB ports even if the notebook is turned off. The workmanship of the Znote 3415W is good. The parts are fit precisely to each other. It's a matter of taste whether one likes the way the plastic parts feel to the touch. The bottom part of the case could be more flexural rigid. If you pick it up, the case creaks. An ideal solution: WLAN can be easily switched on or off via a sliding switch. The location of the indicator LEDs is not that good. 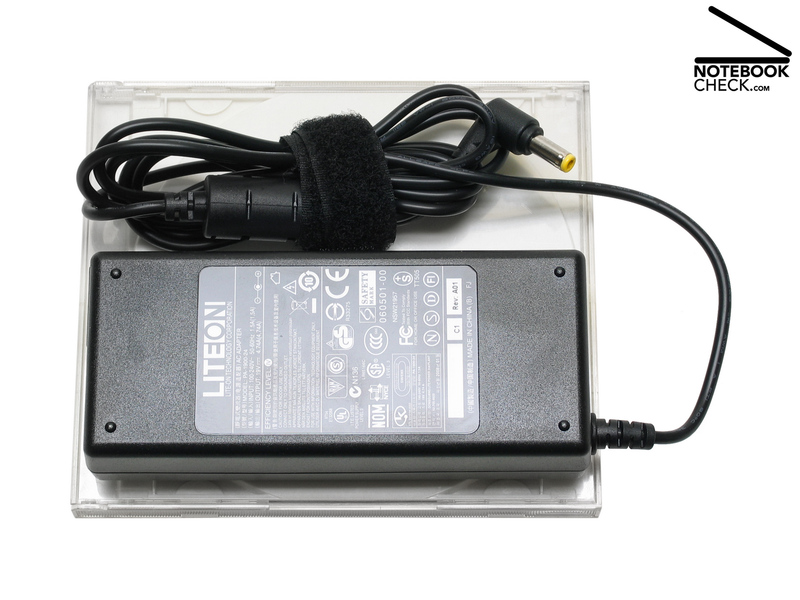 Standard power adapter: One which is also used by many other notebooks.